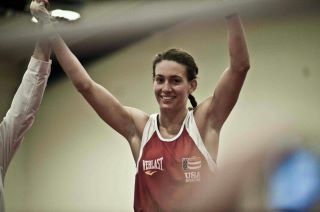 Female 2012 USA Boxing National Champions Crowned! Alex Love (106 lbs), Christina Cruz (119 lbs),Tiara Brown (125 lbs), Mikaela Mayer (141 lbs), Raquel Miller (152 lbs), and Franchon Crews (178 lbs), each veterans of the first-ever female Olympic Trials and each competing in a non-Olympic weight class, will be representing the US once again at the 2012 Women’s World Championships as winners of the 2012 USA Boxing National Championships in their respective weight classes. They will reunite with the three US Olympic Trials champions, Marlen Esparza, Queen Underwood and Claressa Shields, to round out the US team. Mikaela Mayer had the additional honor of being name the outstanding female boxer of the 2012 USA Boxing National tournament. Girlboxing sends a huge shout out to these remarkable women for their accomplishments! 5 p.m. session – Winners will go on to the 2012 Women’s World Championships in China this coming May 2012! « Gaining spots in the Finals @ 2012 USA Boxing Nationals!